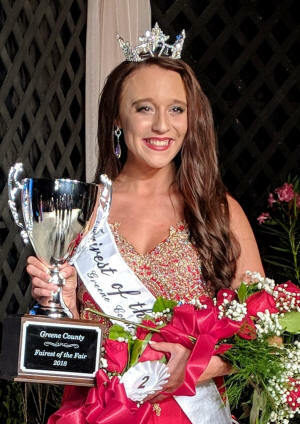 Bailey Cheek was the winner of the 2018 "Fairest of the Fair" competition at the 69th annual Greene County Fair. She is the daughter of Mr. and Mrs. Dan Ricker and Mr. and Mrs. Richie Cheek and a freshman at Walters State Community College. © 2018 Excalibur Data Services. All rights reserved. No portion of this site may be copied for commercial use by any means without the expressed written permission of Excalibur Data Systems.